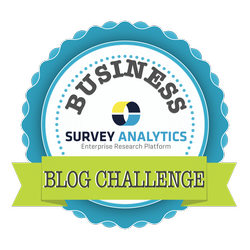 There's just one week left in The Survey Analytics Business Blog Challenge! One of the most important things to remember when you are blogging is that is is not always about you. Other than your own blog which you dedicate so much time to writing, what are some other business blogs that inspire yours? What are some publications that you like to read to keep up on the latest trends and developments in your industry? Who inspires some of the content you create and promote on your very own blog? Continue reading to see 5 of our favorite business blogs in categories from small business all the way to technology, market research and employee engagement. Small Business Trends: Small business success...delivered daily. This publication covers many issues relevant to small business. With over 400 contributors sharing their knowledge, it's one of the top small business publications on the web. The categories range from marketing and social, technology, finance, management, advice all the way to other miscellaneous small business resources. The content is very engaging and highly shared across the board. Geekwire: Dispatches from the digital frontier. This publication is full of independent technology contributions and started right in Seattle back in 2011 by some awesome technology journalists. One of the coolest things about Geekwire is how they deliver the newest trends but keep in tact with old school journalism practices. This is not often a "pay to play" or it's all about who you know kind of publication like many of it's competitors in the tech space. We are happy to be a part of the Geekwire 200 (Seattle's startup leaderboard) that is calculated and repopulated each month. Optimization Group is a full service market research and analytics firm that helps businesses make decisions with facts. Their small team is composed of senior level tech savvy marketers. They have been awarded one of the top next generation market research blogs. Their blog stays right on the industry track of market research trends and includes many guest contributions, too. We have learned a lot from reading their blog on how to explain some of the most complicated methodologies in research in a way anyone can understand. TalentCulture rocks. Anyone involved in business leadership, human resources or recruitment should subscribe to their feed. In short, their goal is to advance the world of work through collaboration and innovation. And that is exactly what they do! They also have a very cool live and interactive chat called #TChat on Twitter each Wednesday that has been going on since 2010. Subjects range from talent strategy, to leadership methods, employee engagement, social workplace issues and technology innovations to make work easier. The WorkBuzz is a great resource for tips on your own career whether you are seeking the job, landing the job or on the job. The categories range from work/life balance to perfecting your own resume and cover letter. This blog is managed by one of our very own customers, Careerbuilder. We love their round up of career tips - like a recent one - "The Office is Not Your Bedroom" or the results from a recent survey that revealed 14% of employees rate their bosses a D or F.